No festival is complete without this bright red dish that draws your eye. 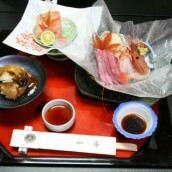 An indispensable dish for Buddhist memorials and festivals in the Okuetsu area. 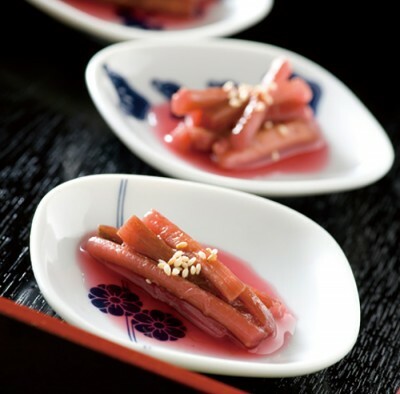 It is made using the leaf stalk from a special type of taro yam known as yatsugashira that has red stalks. Yatsugashira need plenty of water to grow, and thrive in the rice paddies of Okuetsu. 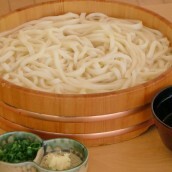 Every farming family grows yatsugashira especially for making suko. It has long been eaten as a food to get rid of old blood, and is often dried to preserve it for long term storage. Remove skin from zuiki and cut to approx. 3cm length. Sprinkle with salt and knead lightly. Mix vinegar and sugar in a large bowl to make a sweet vinegar. 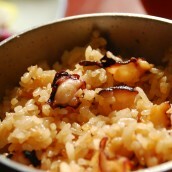 Heat a pan and dry fry zuiki without oil. Once limp, transfer to bowl while still hot. Cover and leave until cool. 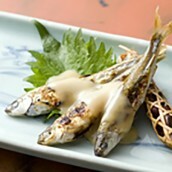 Can be sprinkled with sesame seeds or edamame (young soy beans).